All Our Exes Live in Texas performs in a free, outdoor concert from 8 to 9:30 p.m., Friday, Aug. 10 at the Levitt Pavilion in Westport. All Our Exes Live in Texas is a fantasy draft of Australia’s finest singer-songwriters — Elana Stone, Katie Wighton, Hannah Crofts and Georgia Mooney — here combining in four-part indie-folk harmony heaven. On mandolin, ukulele, accordion and guitar, the Exes are a powerhouse of charm and songwriting prowess. Known as much for their side-splitting banter and feminist politics as their devastatingly beautiful harmonies, All Our Exes Live in Texas have had an impressive career to date. Since forming for an O Brother Where Art Thou? tribute show in 2013, they’ve circumnavigated Australia more times than they can count, playing sold-out headline tours and almost every festival the country has to offer. 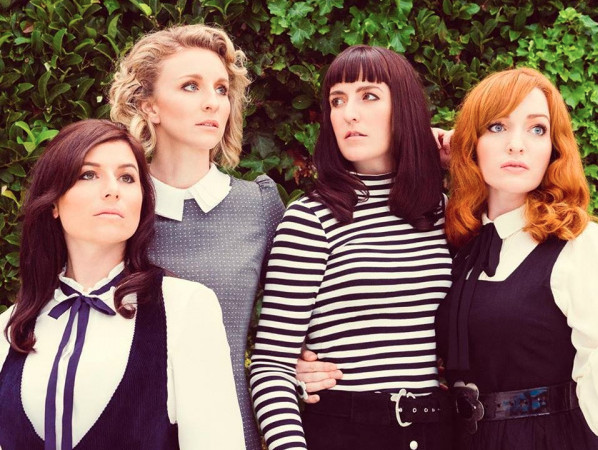 All Our Exes Live in Texas has gained a wide and loyal audience, touring with such diverse artists as The Backstreet Boys (USA), Passenger (UK), Nathaniel Rateliff and the Night Sweats (USA), St Paul & The Broken Bones (USA), Marlon Williams (NZ), not to mention Australian icons Midnight Oil, Megan Washington and Kate Miller-Heidke. They also provided backing vocals on Kesha’s multi-platinum selling comeback single “Praying”. In 2017 All Our Exes Live in Texas won the ARIA award for Best Blues & Roots Album for their critically acclaimed debut, “When We Fall”. In the same year they went home with “Folk Act of the Year” at both the National Live Music Awards and AU Review Awards. Songs from the album were also nominated for the Vanda & Young Songwriting Competition and APRA Song of the Year. “★★★★ … four singularly-accomplished singer-songwriters who together, simply gel” — Rolling Stone Australia. With their fan-base continuing to grow as rapidly as it is in Australia, it is little wonder the Exes are turning heads all over the world. At SXSW 2017 they were listed as one of the “Top 15 Artists to Watch” by NPR’s All Songs Considered, at Nashville’s Americanafest their performances were described as “star-making” and people are still talking about their showcase at Folk Alliance International in Kansas City. When you come to an All Our Exes Live in Texas show, brace yourself to experience intricate musicality, heartbreaking honesty and melodies that soar from four voices that captivate on their own and come together like magic. Add to this, whip-cracking banter and an on-stage synergy that is as effortless as it is alluring, and there’s no chance you can resist the call of the Exes sirens.